When gun violence prevention (GVP) advocates speak about the need for universal background checks and the need to close the gun show loophole, there is always push back from the gun lobby. When those advocates speak about the prevalence and ease of buying guns online, the gun lobby and their followers loudly and condecsendingly point out that you cannot purchase guns online and to even suggest such a thing is proof that you don’t know what you’re talking about. That is a complete fallacy. Let’s look at the facts. Yes, it IS true that you cannot purchase a gun online and have it shipped to you. You cannot go to cabelas.com, add an AR-15 to your shopping cart, check out, and then have it show up on your front porch 5-7 business days later. We know that. They know that. 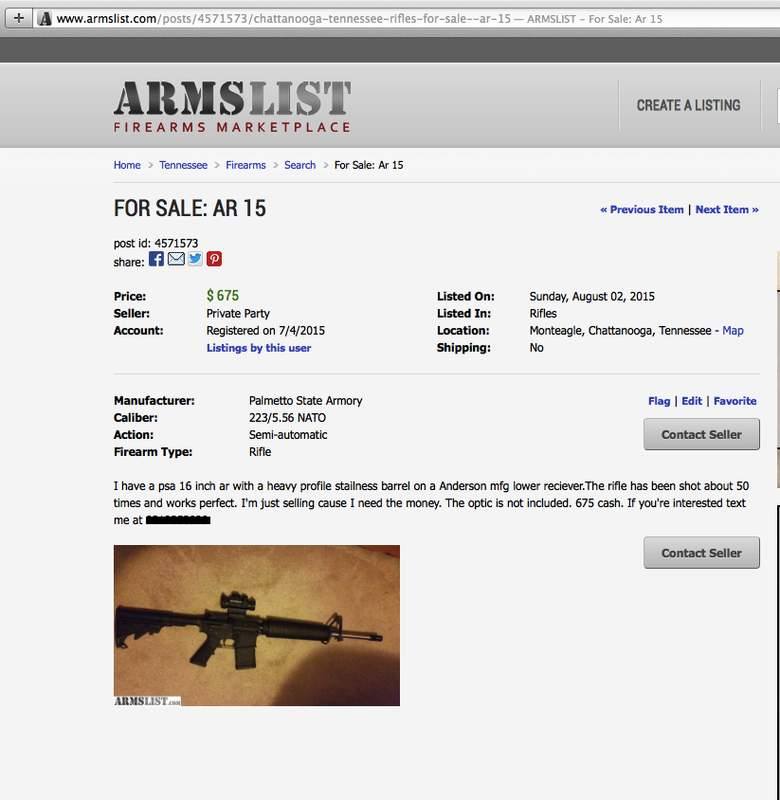 That’s not what “online gun sales” mean. They also know that but they believe that diverting the conversation into “Everybody knows you can’t buy guns online” shuts the argument down. 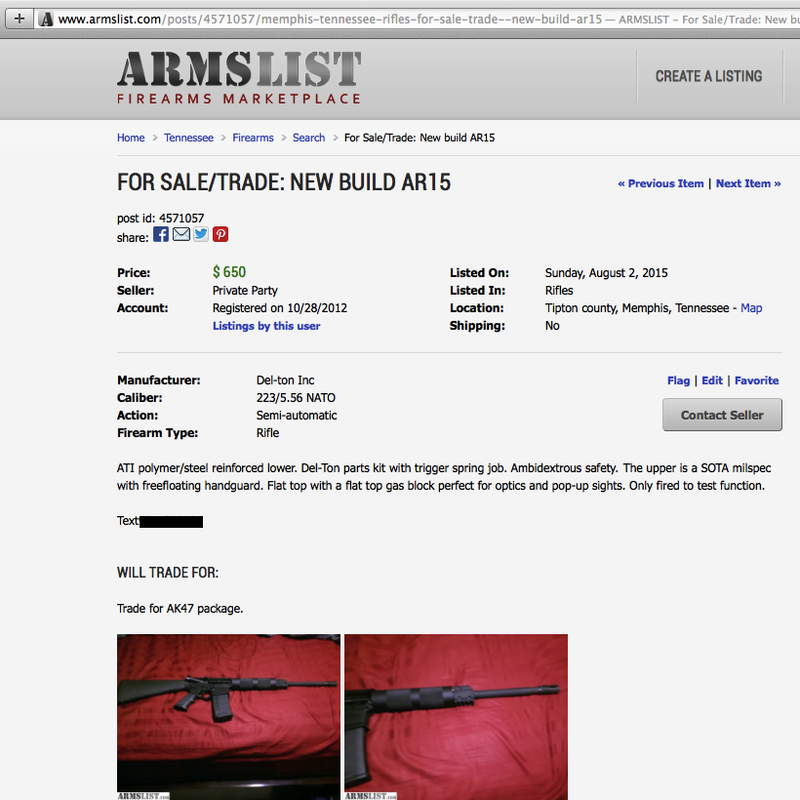 The term ‘online gun sales’ may be misleading. When you hear GVP advocates use that term, what they are referring to is online gun exchanges where buyers and sellers can connect and transact offline. Think of it like an online classifieds section of the newspaper. Actually, think of it like a Craigslist for guns. In that same Gun Control Act of 1968 was language that allowed private individuals to have an “occasional trade.” These are the same words used today to justify private party sales and they are (intentionally?) vague. Does an “occasional” trade mean you sell one shotgun once in your lifetime or does it mean you sell 3-5 semi-automatic tactical rifles with 30 round magazines each month? These “private party” sales are what concern GVP advocates. 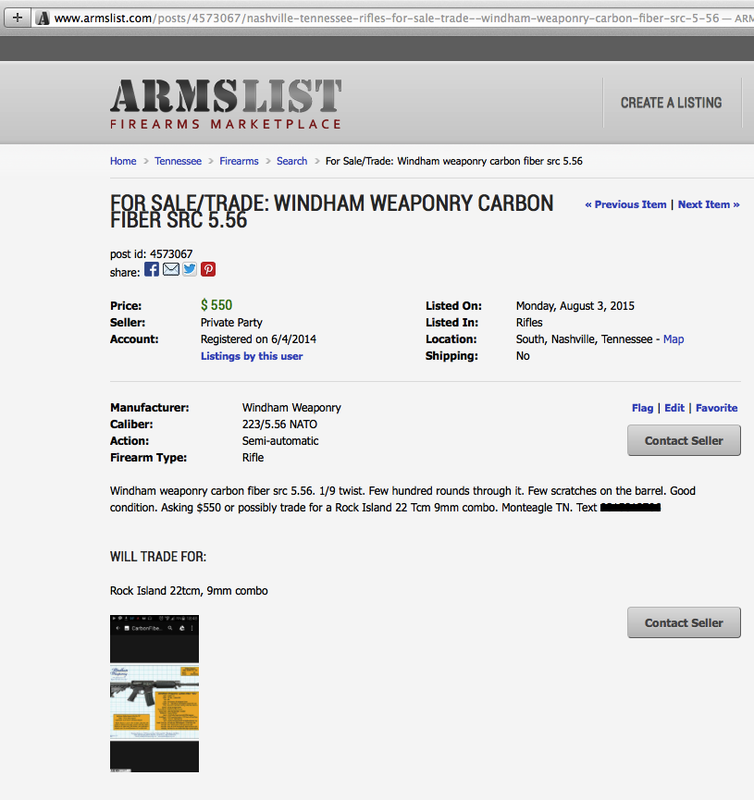 These private party sales are what “closing the gun show loophole” means and what “universal background checks” mean (to sell guns inside a gun show requires an FFL but it’s anything goes in the parking lot between private individuals – just as it is when it comes to online exchanges that connect buyers and sellers). GVP advocates want these loopholes closed because these private party sales can legally take place without any background checks. The online gun exchange sites have disclaimers that instruct you not to sell firearms to people outside of your state and that they can’t be felons and that you have to be 18 to even look at the site. Of course there is no way to enforce any of this. No way whatsoever. 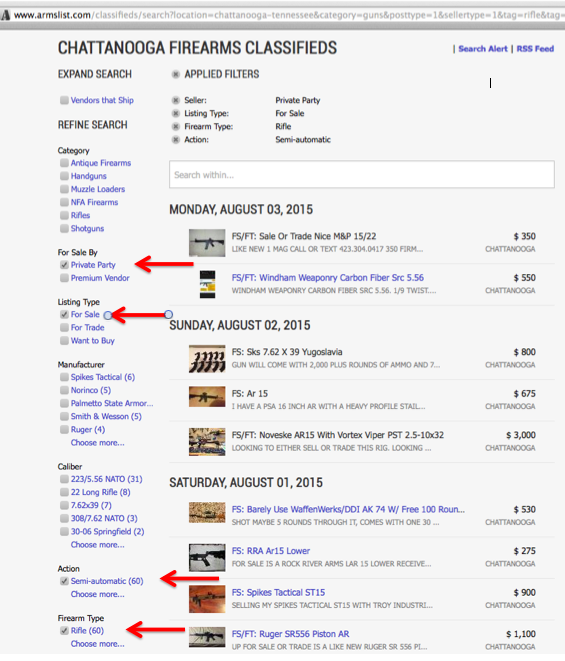 Back to Armslist…The site is designed much like Craigslist. The interface is extremely easy to navigate and there are multiple filters that allow you to narrow your search criteria. 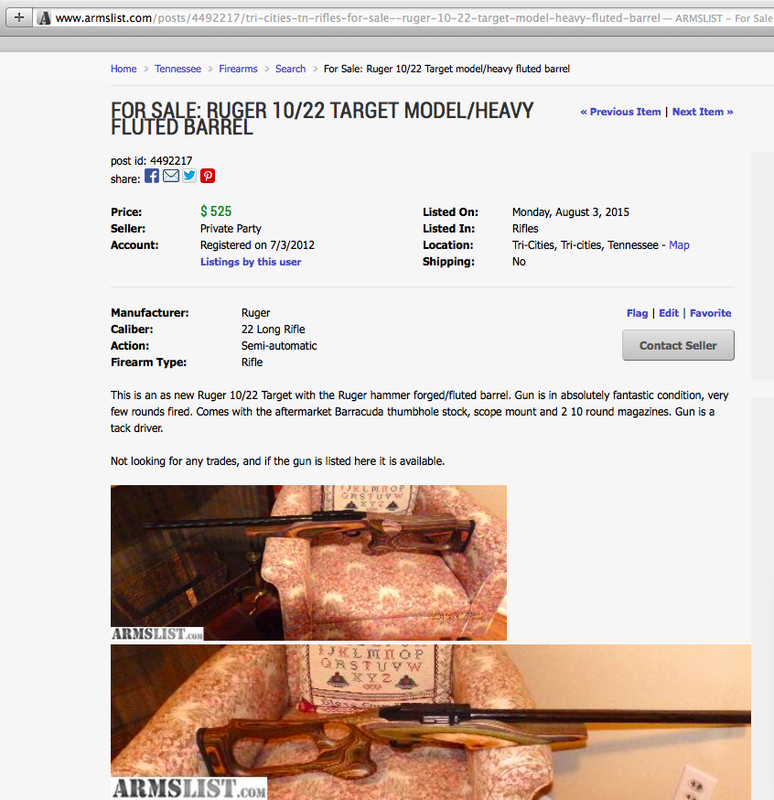 Like Craigslist, you see a listing that interests you, click on it and look at the details and photos. If you decide you might want to buy it, you contact the seller. Like Craigslist, there is a “contact seller” button where you send a message to the seller and sometimes the seller will provide their actual email or phone number. You then negotiate price, just like Craigslist, and then agree to meet somewhere to complete the transaction. No record. Often times in cash. These transactions COULD happen with a background check but that would require the buyer and the seller to both agree to it and then they would have to find an FFL to do the background check. And, there’s a nominal fee for a background check. And, it’s a hassle. And, there are a number of second amendment advocates who feel that background checks are unconstitutional to begin with. So, you can guess how often private party sales include background checks. It’s likely that many occur without even verification that the buyer is a legal resident of the state. Besides, in most states including Tennessee, private party transfers of firearms do not require a background check. Sure, Tennessee law prohibits any person from purchasing or attempting to purchase a firearm knowing that he or she is prohibited by state or federal law from owning, possessing or purchasing a gun. Obviously, this whole system requires a lot of taking people at their word – that sellers will ask and buyers will tell the truth. When it comes to selling weapons designed that could fire dozens of bullets in a matter of seconds, should we really rely on the honor system? Bill’s words to God’s ears. The NRA and gun lobby have historically had no problem whatsoever with these kinds of websites. They also vehemently reject the push for universal background checks and viciously attack anyone who dares to say otherwise. But, let’s think about this for a minute. According to FBI reports at this point, the Chattanooga shooter looks to be either a homegrown, self-radicalized terrorist or a mentally unstable depressed substance abuser on a downward spiral or maybe a combination of both. Some suspect that he may have had outside help or be part of a larger terrorist cell. Even the fiercest second amendment advocate should be concerned at the idea that someone in any of those categories could easily purchase a firearm. What if the Chattanooga shooter was an angry drug addicted young man bent on hurting as many people as possible? What if he WAS a terrorist or even a group of terrorists? Should we make it as easy as possible for him to purchase high capacity semi-automatic rifles? It boils down to just two people meeting in a parking lot somewhere exchanging cash for a gun. No record. No witnesses. No one’s the wiser. So, let’s say you are an abusive spouse whose partner has filed an order of protection. Or maybe you have a felony conviction for armed robbery. Maybe you’ve been involuntarily committed to a mental health facility recently because your family was concerned that you were a danger to yourself or others. Or, perhaps you’re a homegrown terrorists who wants to take out as many people as possible and you know you might be on a watch list. Maybe you’re an angry extremist who wants to make a violent statement. You want a gun and you know you can’t go to a FFL dealer to buy one. 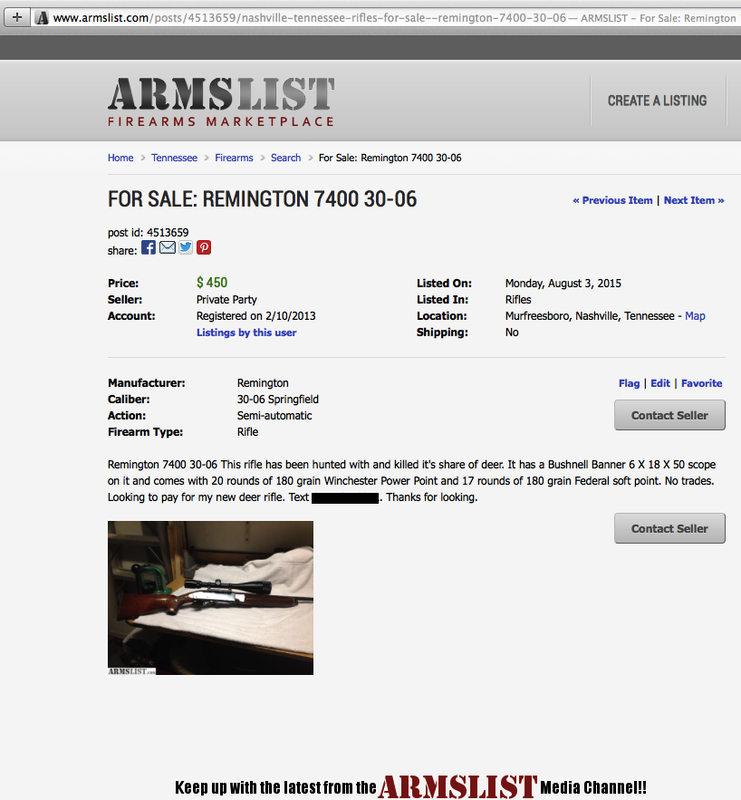 So, you visit armslist.com. 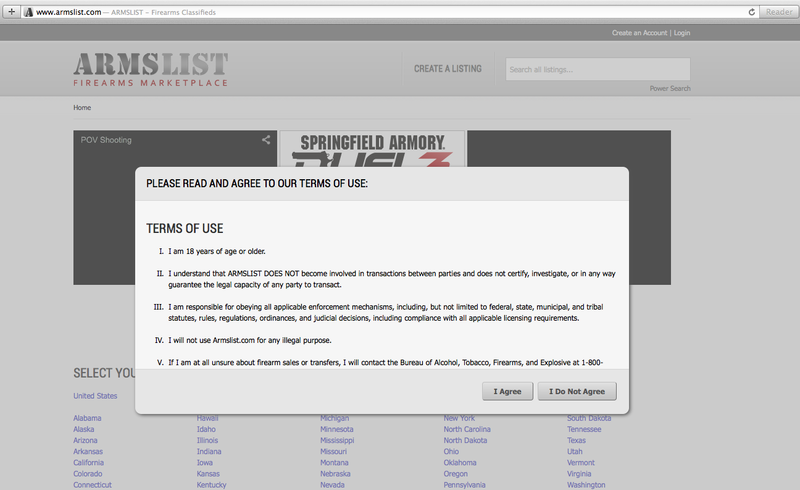 The landing page includes a terms of agreement statement that you must agree to in order to access the site. The terms of agreement include statements promising that you’re 18 and legally allowed to buy and sell weapons and that you won’t proceed with a sale if you suspect someone is a prohibited purchaser. But, of course there’s no way to verify your age or your legal status or even your state or residence. You click “I agree” and you’re in. Well, that was easy. So, you then just select your state. I picked Tennessee. On the left side of the page, you can refine your search. 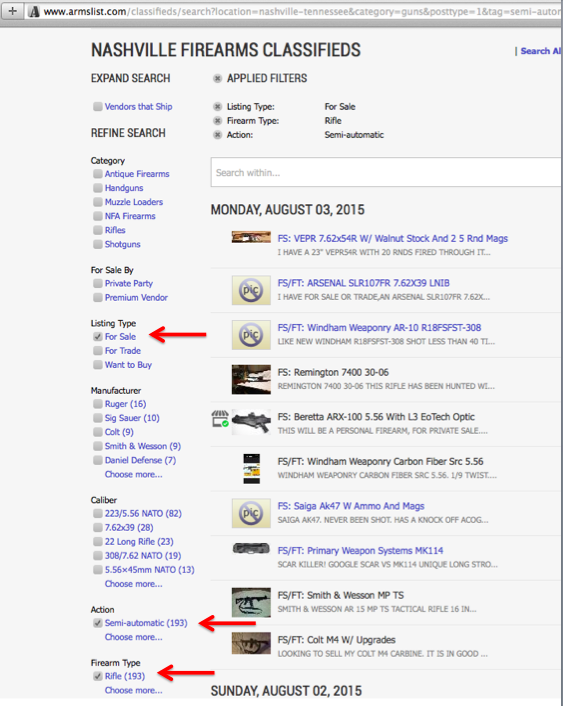 You can choose a category (firearms, firearms accessories, etc). You can also choose whether you want to purchase from a premium vendor (licensed dealer) or private party. You can indicate whether you’re buying or selling or interested in a trade. 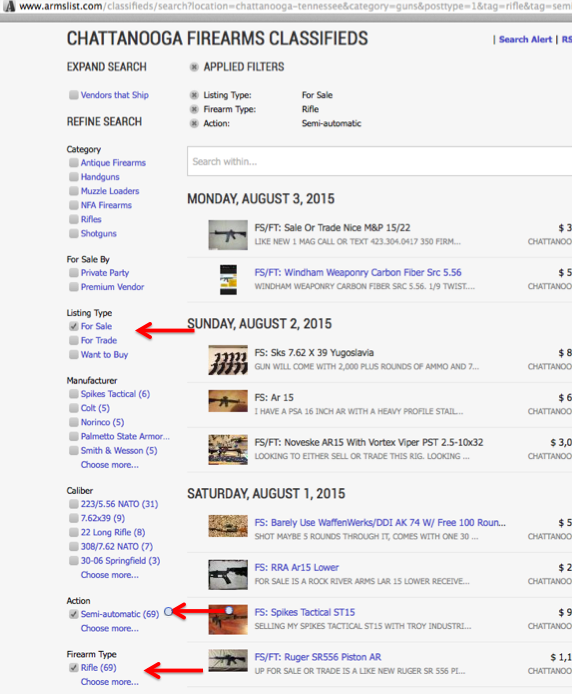 Then, you can choose to search by manufacturer, caliber, action, and type. 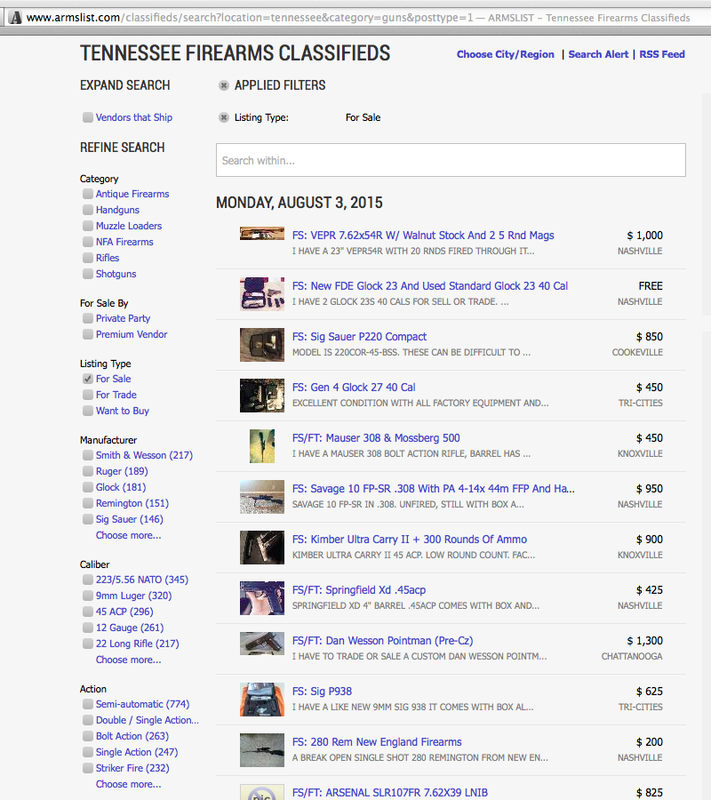 What’s the total number of guns for sale in Tennessee today? What percentage of those guns for sale are through private parties and do not require background checks? Because the listings are broken out by various categories, I’m going to look specifically at semi-automatic rifles. 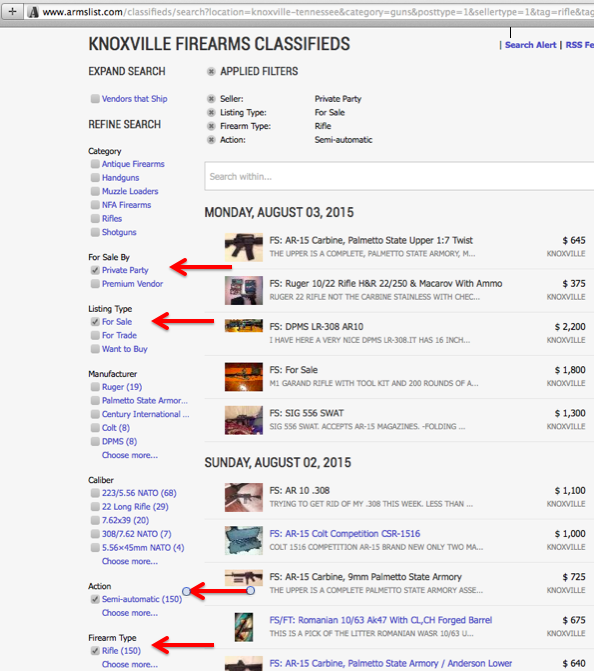 According to his friends, the Chattanooga shooter purchased at least three rifles through Armslist. So, I’m going to select these filters: Firearms; For Sale, Semi-automatic, and Rifles. I haven’t yet selected private party. So the number to the side of semi-automatic and rifle represent the total number of semi-auto rifles being offered for sale in Tennessee. The total number is 630. Now, let’s see how many are for sale by private party. Remember, I’m someone who can’t pass a background check. I only want to deal with a private seller who can legally sell me a gun without any official verification or way of finding out that I’m a prohibited purchaser. I’m going to commit a crime and don’t want any record of the gun I’m about to buy. To find these sellers, all I have to do is add “private party” as a search criteria. 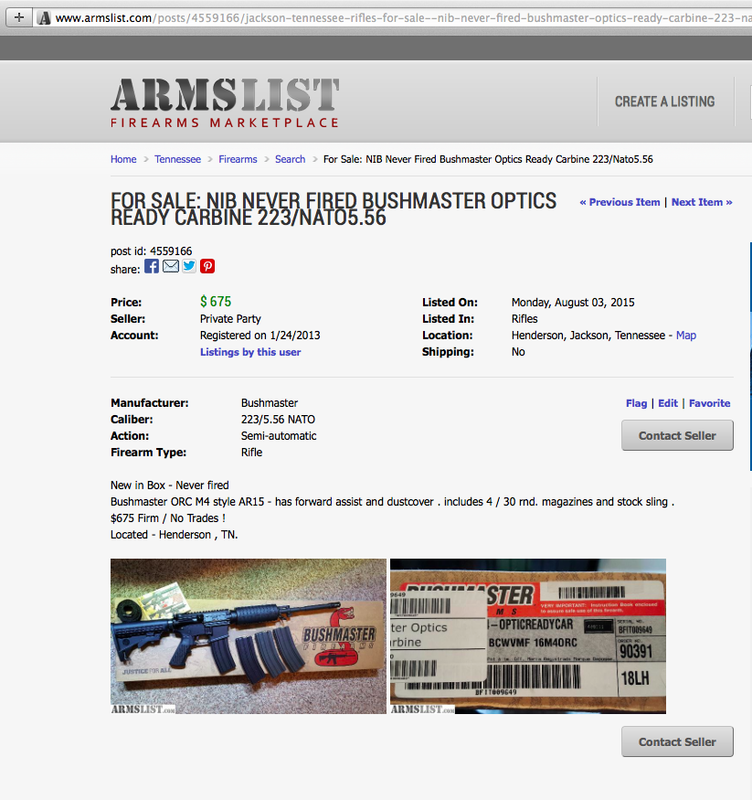 So, we see that the total number of semi-automatic rifles for sale in Tennessee by private parties is 600. That means that 95% of the semi-automatic rifles for sale in Tennessee via Armslist are through private sellers and could be purchased without a background check. 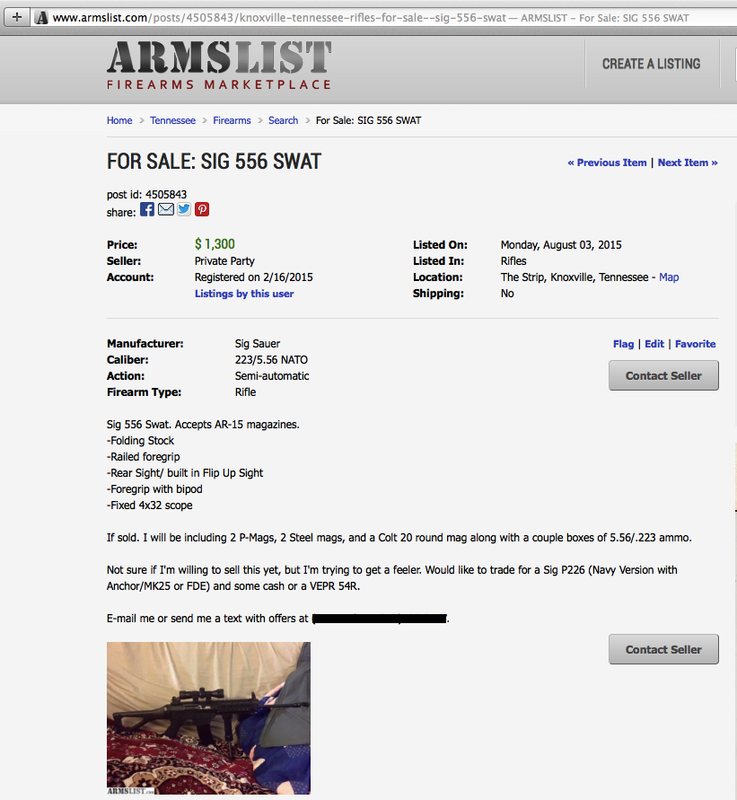 In Chattanooga, where 5 US service members were gunned down, there are a total of 69 semi-automatic rifles for sale. Of those, 60 are for sale through private sellers. 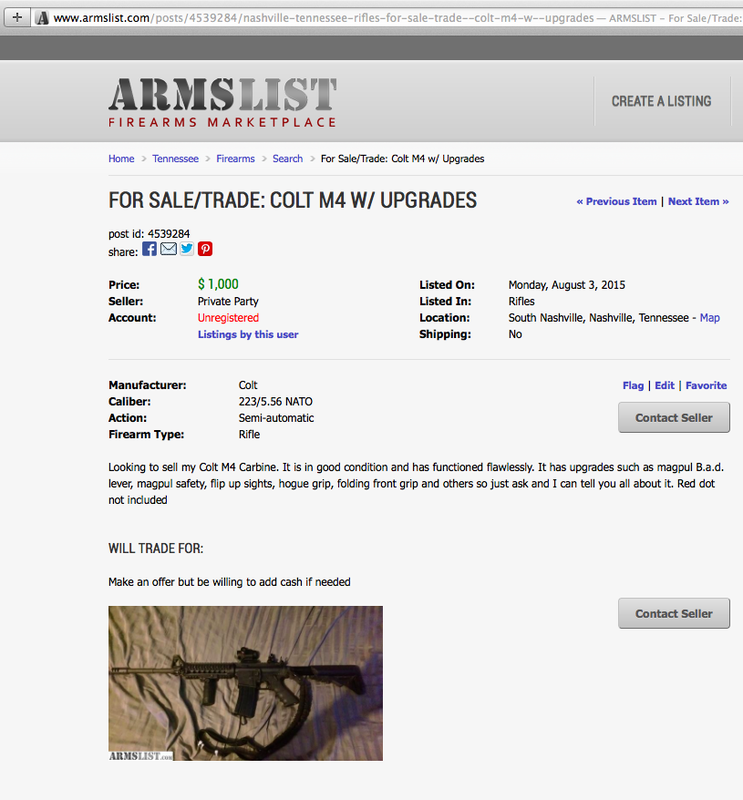 That means 87% of the semi-automatic rifles for sale in Chattanooga via Armslist are through private sellers. 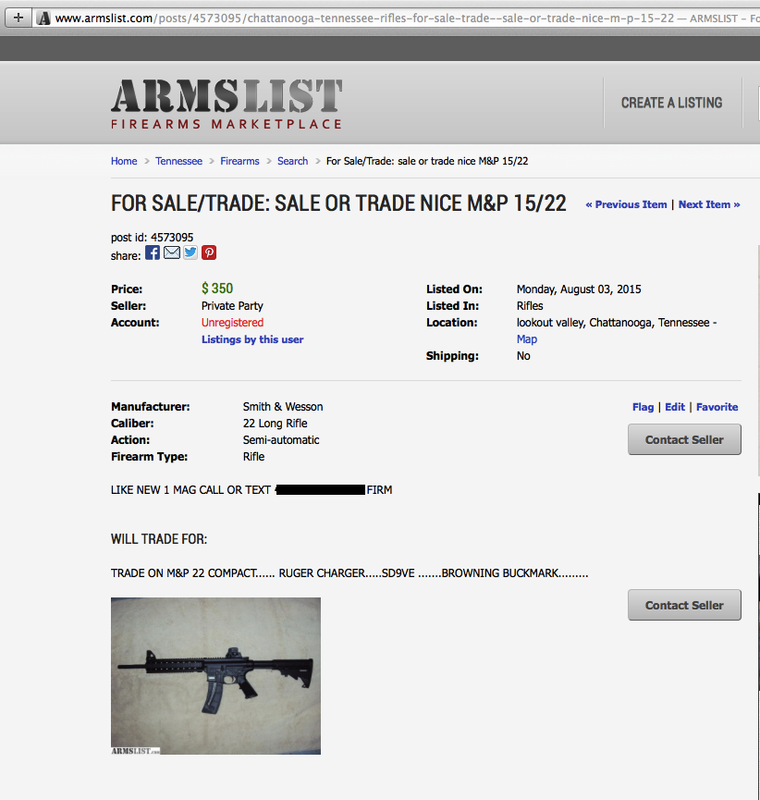 About two hours to the west of Chattanooga in Nashville, there are 193 semi-automatic rifles for sale. And, 187 of those are offered by private sellers. So, 187 of 193 are for sale by private parties. 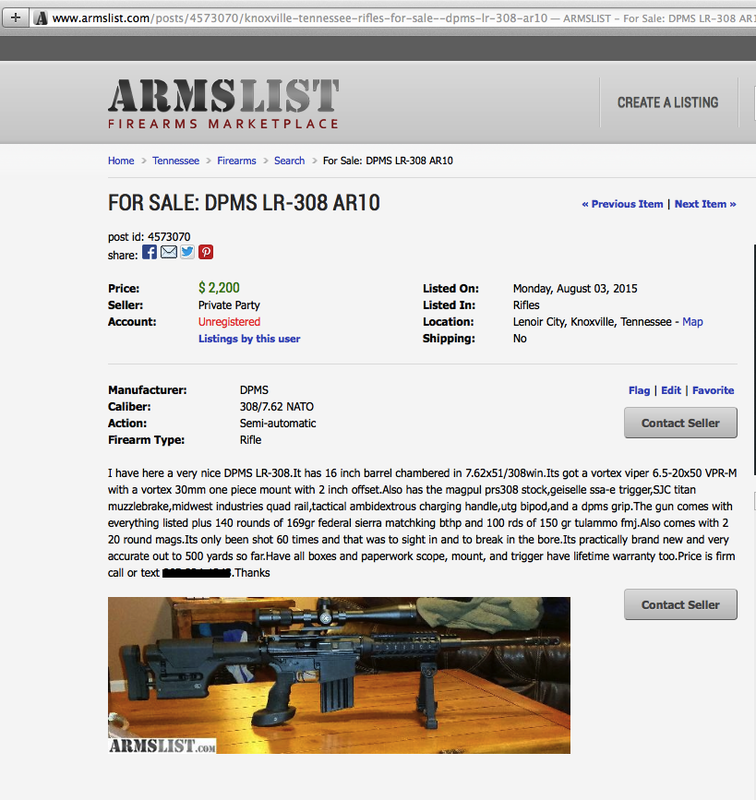 That means 97% of the semi-automatic rifles for sale in Nashville via Armslist are through private sellers. 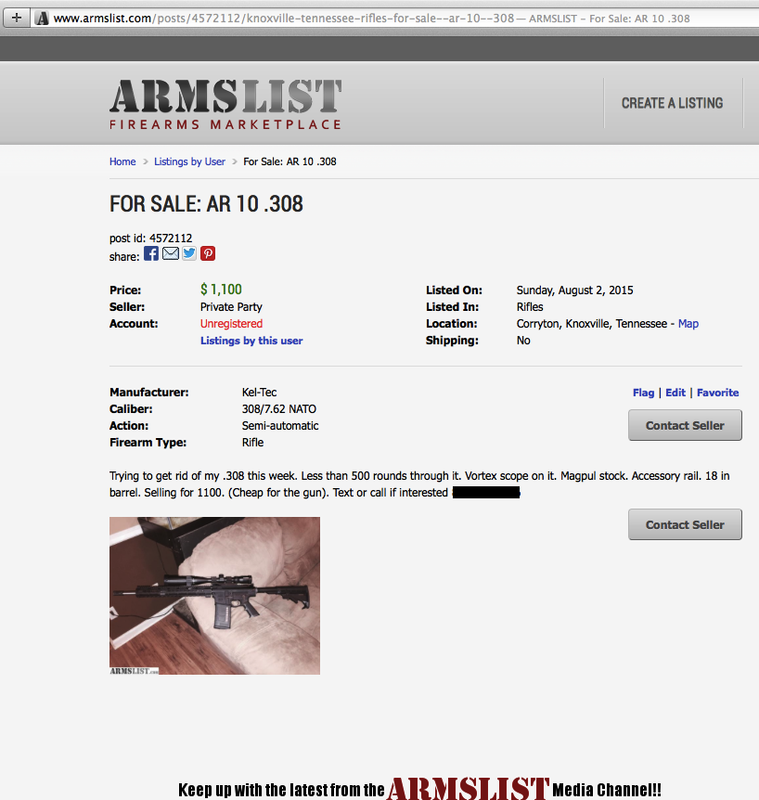 In Knoxville, just over 100 miles to the east of the Chattnooga shooter’s home, there are 150 semi-automatic rifles for sale through Armslist. Now, let’s see how many are offered by private party: Oh, ALL OF THEM. 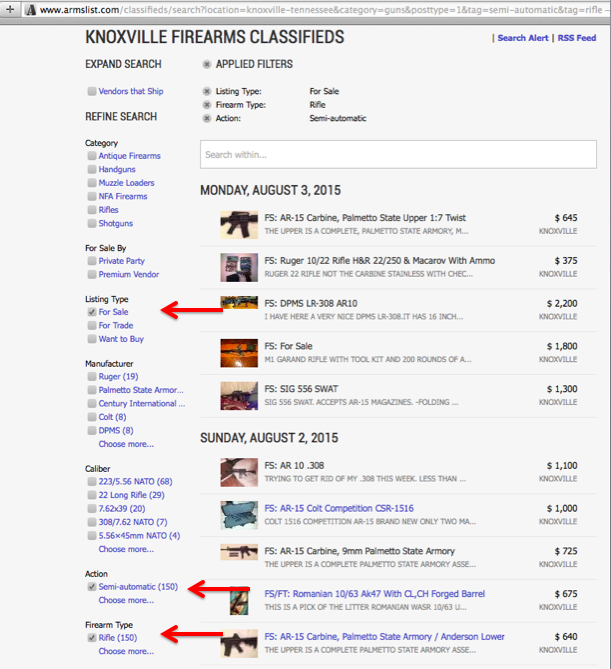 100% of the semi-automatic rifles for sale in Knoxville via Armslist are offered through private sellers. Without background checks. Wow. 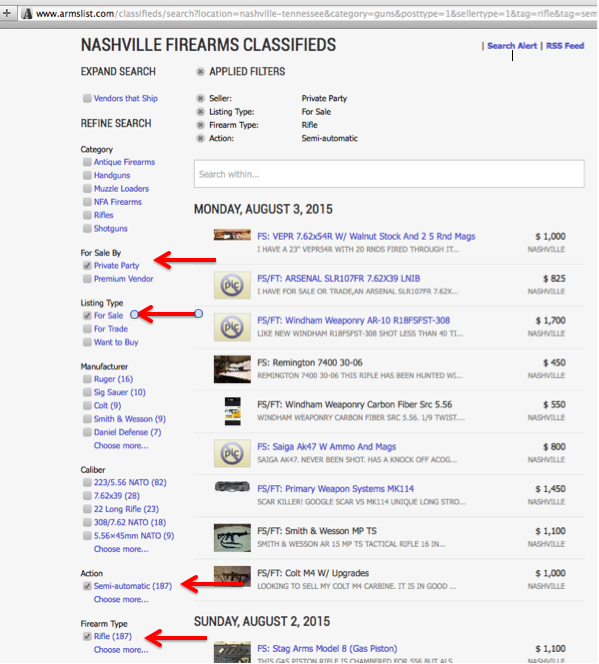 Here are just a few listings for semi-automatic rifles for sale that were listed Sunday August 2nd and Monday August 3rd in the state of Tennessee. Some sellers note in their listings that they require proof of residence and a bill of sale to be recorded. None of these do. Also, these are listings that have been posted in the last two days only. 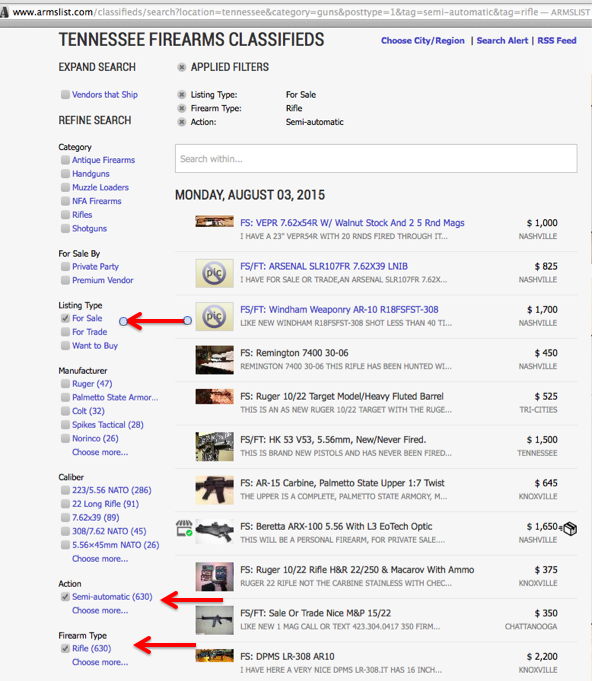 Postings, like on Craigslist, go back for days, even weeks. Sellers remove them once the gun has been sold. 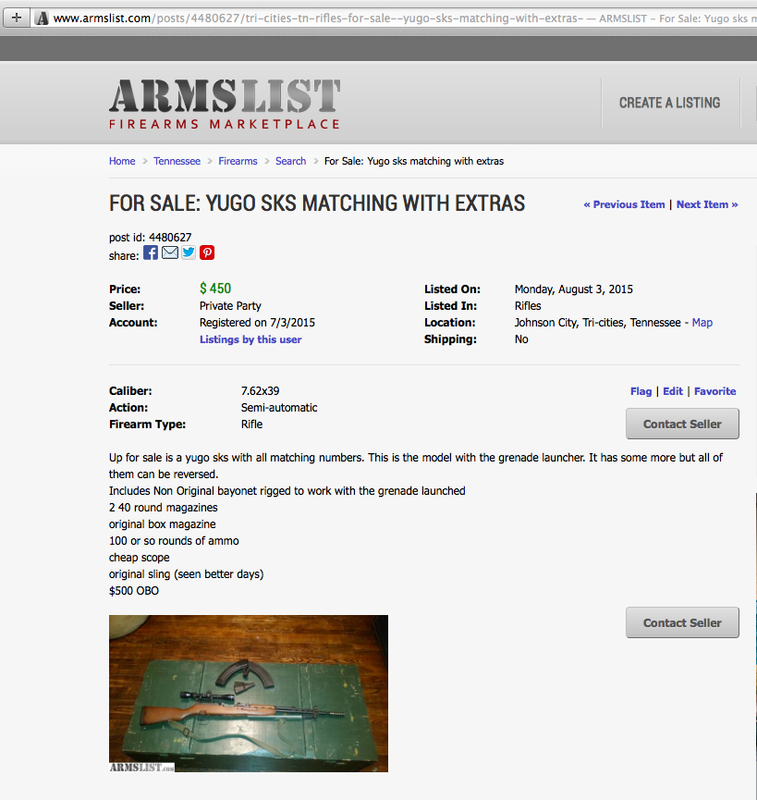 Remember, these are just semi-automatic rifles for sale via private party on Armslist. In the state of Tennessee today, there are also 917 pistols and 192 revolvers also for sale via private party. And 276 shotguns. That’s a lot of firearms potentially being bought without background checks and in most cases, no record of sale. If you wanted to buy a gun, couldn’t pass a background check, and wanted to no record of the purchase, wouldn’t this be the easiest way possible to acquire that gun? The next day, after purchasing the gun, he went to the salon where his wife worked and killed three people including his wife, wounded four others and then killed himself. The man would not have been able to pass a background check through an FFL. 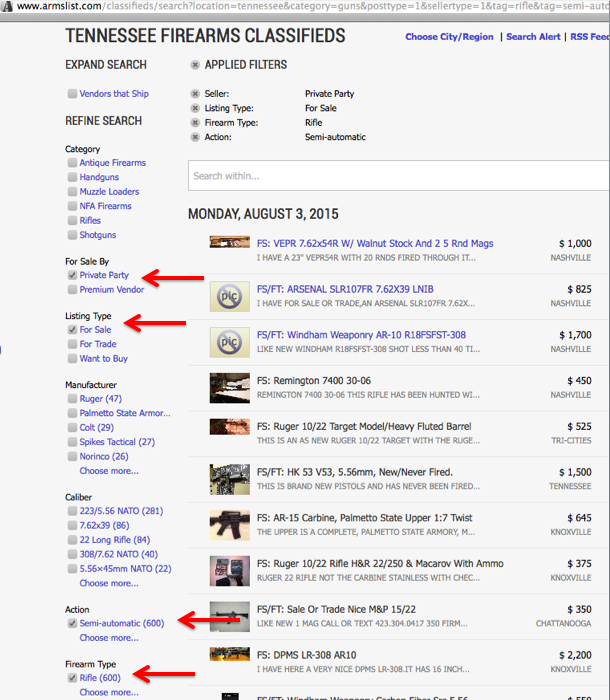 And, although Armslist.com is the biggest and best known exchange, these online gun exchanges are all over Facebook, too. On Facebook, there are multiple exchanges operating as closed Facebook groups. 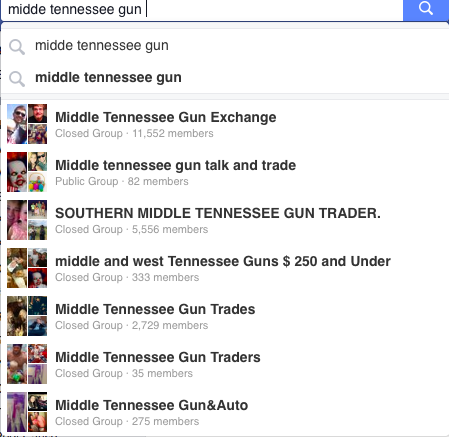 In Tennessee, for example, Middle Tennessee Gun Exchange has over 11 thousand members. 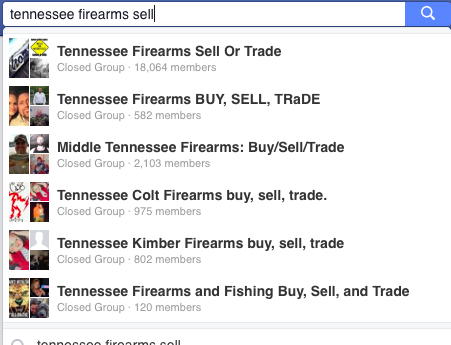 And, Tennessee Firearms Sell or Trade has over 18,000 members in their closed group. And there are more. And they’re in most all states. And, they are all perfectly legal thanks to the “gun show loophole” that allows the “occasional trade” of firearms between private citizens. 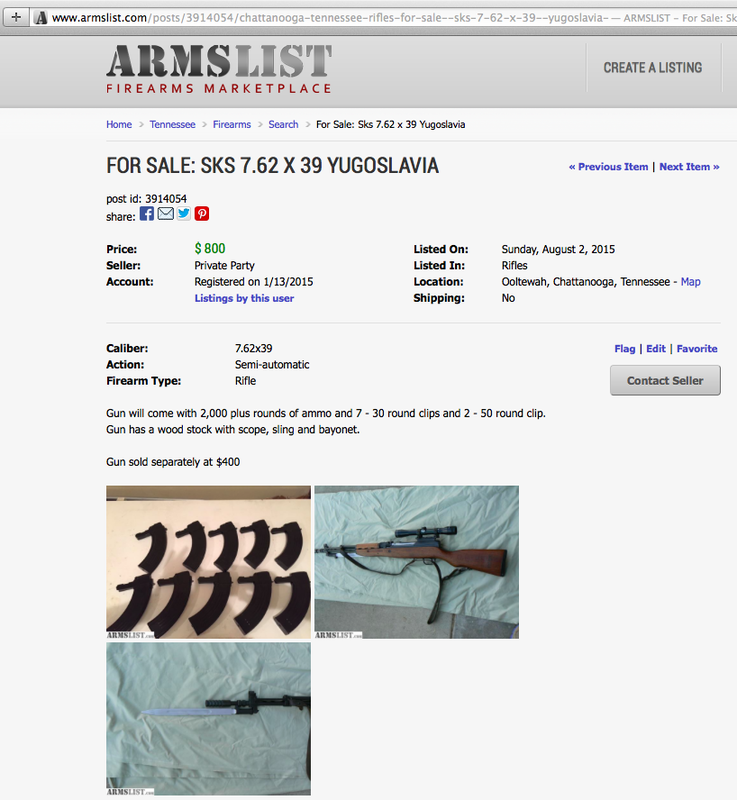 And, yes, the vast majority of armslist.com users and closed Facebook gun exchange group members are law abiding citizens and are good people who simply want an easy to way to sell or buy a gun and maybe find a bargain. They would never intentionally or knowingly sell a gun to someone they suspected was going to use it to commit a crime. But, all it takes is one seller knowingly or inadvertently selling a gun to one buyer who wants to hurt people. Then, you have victims and devastated families who will spend lifetimes coming to terms with their loss. Bill O’Reilly is right. Online gun exchanges are a “back alley” way of obtaining a firearm. And, yes, the NRA should follow the lead of many of its own members who believe that all gun sales should require a background check. Would universal background checks mean “bad guys” would never get their hands on a gun? No, of course it wouldn’t. But, you have to ask yourself- why on earth do we make it as easy as possible for them to do so? Why do we all go along with a system clearly designed to make it easier for the those who shouldn’t have guns to easily get their hands on them? How has the NRA convinced congress that we must allow those who can’t pass a federal background check to be able to acquire a firearm? Meeting a stranger in a parking lot to exchange cash for something is how you buy a couch. It shouldn’t be how you buy a gun.